(Text automatically translated) discount for 2 persons only except July and August. 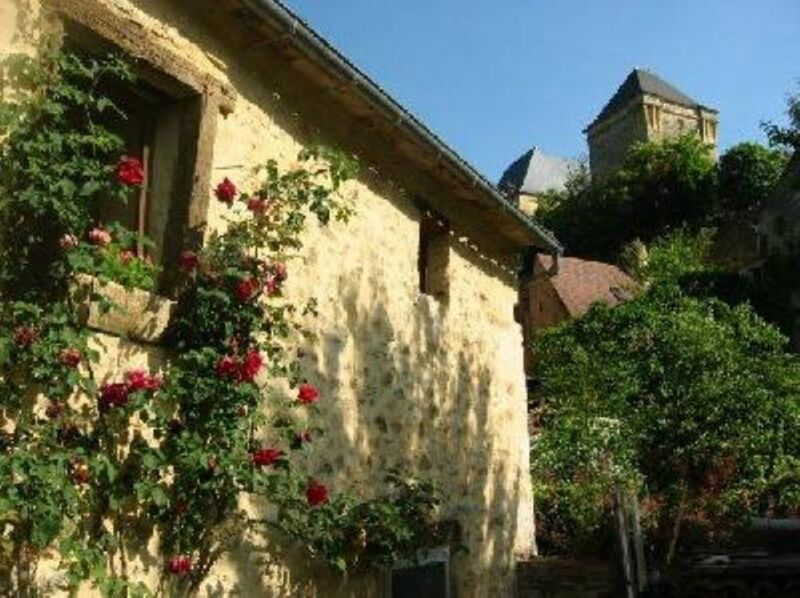 very quiet, stable seventeenth completely renovated in the heart of the Dordogne, near Les Eyzies website prehistory, Sarlat, a medieval village, gourmet markets in the summer, above ground pool with views of the castle and dungeon twelfth century medieval village. WIFI.petit enclosed front extended by a large unfenced with aboveground pool protected by a barrier field house garden. it is shared only with the owner, who is there only for the lack of tenants. And I appreciated your smiles... always happy even if the wearher started being awful the day you arrived. I'll be very happy to see you again and share a nice French meal with you. "We were the family of two adults and one kid from the Netherlands. We stayed in Berbiguires for two nice weeks. It is nice picturesque village with a castle. The house is nicely refurbished 500 years old building. It is quite roomy and clean. The kitchen is clean and it's equipped with everything you need. The house is located on the quite street (actually one of two in this small village). There are a pool and huge garden behind the house. Children can enjoy the playground. The owner is very warm person and she speaks perfect English. There are plenty of things to see around. If you like the medieval France this is the place to be. You can visit famous towns like Perigueux and Sarlat but there are also tens of castles almost in every village. The nearest supermarket is in the neighboring village (ten minutes drive). We were very satisfied with our staying." Belle adresse pour visiter le Périgord noir. Gîte très bien équipé au calme, c’est un beau point de départ pour visiter la région qui est superbe. Il ya énormément de sites à voir , de balades à faire dans les environs immédiats. Une belle adresse. Merci Ines pour votre très bon accueil! La maison est bien équipée et la literie très agréable! La maison est idéalement située pour visiter le Périgord noir. Nous avons passer le réveillon du 31 Décembre bien au chaud autour d'un bon feu de cheminée. Mention spéciale à Nanou qui a réservé un très bon acceuil aussi aux enfants! Petit séjour parfait : location bien conçue et parfaitement équipée, propriétaire prévenante et sympa et village pittoresque. La location est au calme dans un village à 2 pas des sites touristiques. locataires charmants également, la location était dans un état de propreté parfaite. (Text automatically translated) Berbiguieres is located along the Dordogne, fork in the road Bergerac-Sarlat St Cyprien. (Text automatically translated) wonderful restaurants and inns offering delicious local produce, markets gourmants evening with catering in beautiful sites.en July Sarlat Theatre Festival. Many concerts, festival of the Dordogne.